Whey has become a must have supplement for most bodybuilders and other athletes because it’s the best quality protein. More recently, whey has also caught the attention of the anti aging/longevity minded groups also for its purported beneficial effects. If you are using nutritional supplements, chances are you are either using or you are contemplating the use of whey protein. Unsurprisingly, there are a plethora of manafacturers all claiming to be the best whey protein powder. With so many protein powders on the market, which one do you choose? The Organic one? The one with the most protein? Ion exchange isolates have the highest amount of protein per gram, but are they the best whey protein powder ? No, choosing which whey to purchase is far more complicated than just protein content, and protein content is definitely not the most important factor when deciding which whey to use. so how do you choose which is the best whey protein powder to purchase? Here are some guidelines to help you pick the right one! Whey is one of the two types of protein found in milk – the other being casein. Whey makes up approximately 20% of the protein in milk and is a very high quality source of protein that is easily digestible and quickly absorbed, with a high branched chain amino acid (BCAA) content and a high biological value. Whey also has research-proven benefits as a fast acting protein source, making it ideal for post workout replenishment. Though ive not as yet researched this it has been claimed that a number of studies have also found that whey may potentially reduce cancer rates, combat HIV, improve immunity, reduce stress and lower cortisol, increase brain serotonin levels, reduce blood pressure, and improve performance, to name a few of its potential benefits. Protein supplements however as their name implies should be a supplement to our diet not the mainstay of it. These powders provide your muscles with protein to rebuild, however they should not be considered superior to a well balanced nutritious meal. Although their ingestion post exercise has been shown to increase muscle synthesis there is nil evidence that any of these powders rebuild muscle more efficiently than natural food sources such as meat, fish or eggs. However they are excellent to provide quickly assimilated protein post workout, and extremely useful “on the go” to provide adequate easily absorbable protein. Additionally they are required if you have not ingested enough protein from normal meals, or you’ve missed a meal for some reason. Protein powders can therefore be helpful if you aren’t getting enough protein from whole food, or if you want the convenience and portability of a protein source that is easily ingested. However protein powders are a highly processed food supplement, and they must be refined in order to be palatable and sustain a long shelf life. Although protein powders are derived from whole food sources, they’re not in themselves whole foods. This is because protein powder is created by extracting the protein component of the complete food by the utilisation of various processing methods. Unfortunately not all processing methods are created equally! Different processing techniques result in surprisingly varied protein profiles. There are two sure ways the quality of protein can be ruined during processing, the first is high temperatures and the second is extremes in pH. I would not pretend to know the exact details of the processing methods and debate still continues as to which method produces the best whey protein powder. These are created by separating the protein from the original food. This is accomplished by means of an alcohol wash, water wash, or ionisation technique. Of these methods water is the least expensive and ionisation is the most expensive. After its creation the isolate undergoes a filtration process, at this point nearly everything aside from protein has been eliminated with minimal carbohydrate, fat, fibre and phytochemicals left. Isolated protein is usually about 90 – 95 percent protein by weight. The advantage of a good isolate is that it contains more protein, less fat and less lactose than concentrates. Concentration is a drying process utilising high heat and acid extraction to reduce the entire food source into a concentrated protein powder. During this process other impurities can be concentrated with the protein.The final concentrate is about 60 – 70 per cent protein by weight. I believe that the protein maybe less denatured than with some isolates. The drawbacks of concentrates are they have slightly less protein than an isolate, and contain higher levels of fat (though these fats may in fact have beneficial effects) and higher levels of lactose. Concentrates retain a high quantity of BCAAs. Although it is renowned for causing bloating, because of the favourable cost to quantity ratio this is the most commonly used source of protein by the bodybuilding community. Hydrolised protein was popular a few years ago and is making a comeback. Hydrolysed protein is created by the addition of water to protein polymers and breaking them into groups of protein peptides. The groups consist of from 2 to 5 amino acids. This process is performed to enhance absorption as hydrolysis is essentially pre-digestion. Because the protein is already partially ‘broken down’ it is absorbed by the body faster. It has not been proven whether this has any benefits for athletes. Ion-exchange isolates are made by running concentrates through what is called an ion exchange column, which separates proteins based on their electrical charge. Products processed by this method have high protein densities, around 95% protein by calories, but the process has a detrimental effect on the quality of the protein. Due to the nature of the ion exchange process, the most health promoting components are depleted. Though the protein content is increased, many of the important sub-fractions are lost or greatly reduced and some amino acids are denatured, notably, the glycomacropeptides, immunoglobins, and alpha lactalbumin. These components are the valuable and health promoting fractions which are lost in ion exchange process. Ion exchange also exposes the product to extremes in PH and is not recommended. Ion exchange whey is for those who simply want the very highest protein contents per gram. Remember though that the higher protein content comes at the cost of a loss of many of the sub-fractions unique to whey. So this process is unlikely to produce the best whey protein powder. Seeing as micro-filtration (see below) produces a similarly high protein content, the choice is a “no brainer” as far as I am concerned. These filtration processes remove contaminants from the concentrated protein component by passage through a membrane. I am not aware which filtration method, if any, is superior. The Micro filtration processing method uses a low temperature technique that allows for the production of very high protein contents (>90%), the retention of important sub-fractions, extremely low fat and lactose contents, with virtually no undenatured proteins. Cross-flow micro-filtration is purported to produce the highest level of undenatured protein available among whey powder isolates. I believe that these are the processing methods that result in the creation of the best whey protein powder and I therefore recommend products created by these processes. Why should I use a whey protein powder? With data from numerous studies demonstrating the importance of protein for health and body composition, dietary protein supplements are among the most popular available. The reasons are not difficult to understand considering that whey is a protein powerhouse more potent than egg whites, formerly the standard bearer for measuring protein assimilation and potency. With regard to the purchase of the best whey protein powder there are a number of caveats however: Read the label and the list of ingredients of the protein powder and be very wary of any product that falsely claims it will increase your strength and size, contains ingredients which are totally unfamiliar to you, or has multiple ingredients (generally more than 4 or 5). Lists of artificial ingredients should be a warning sign. It’s difficult to find protein powders that are not loaded with artificial flavours and artificial sweeteners but you need to. You want your product to be as close as possible to pure whey protein. Do not opt for the product with “added vitamins” or “proprietary brand ingredients” (code for we are not going to tell you what we’ve put in here) “added creatine” etc. If you need these ingredients you would order them separately. Try to obtain a product with natural flavouring, if you cannot obtain a product that is naturally flavoured whey, go for chocolate flavour as this only requires the addition of cocoa. Artificial flavours generally just introduce further unwanted chemicals. Supplements are a huge business and massively profitable so when you are looking to decide how to spend your money, you need to have your buyer beware hat on! You need to ask yourself the question – Is the person or site advising you to take the product benefiting financially if you purchase that product. If the answer is yes then there are vested interests involved and you need to be careful. Otherwise you could be taking advice in order to waste your money on items which may be unnecessary or ineffective – this includes purchases based on my recommendations too. As an educated consumer you need to know the differences, and be able to discern good quality whey from ineffective imitations. Don’t be fooled by any claims of “scientific” superiority, trademarked processes, or fancy marketing terms, its BS – do your due diligence! So which is the best whey protein powder? These are my product recommendations: I usually buy organic products where possible, I’m a big fan of organic dairy products like milk and yogurt especially if they derive from properly-raised, happy, grass – eating cows. Organic products however are generally much more expensive. I believe that Pulsin whey protein isolate is one of the best whey protein powder available – it can be ordered via the link to discount supplements here. I admit to being biased toward organic products but the reason I consider this the best whey protein powder is “it is what it says on the tin” which is microfiltered whey protein from grass fed cows with zero junk additives. Pulsins’ whey protein is isolated using a combination of Cross-flow Ultra filtration and Micro filtration techniques, which preserves the structure (and therefore quality) of the whey protein without causing any denaturing. The resulting protein isolate then has added lecithin so that it can be mixed more easily. That’s it. there are no other unnecessary added ingredients and importantly, all of their whey protein is produced from UK milk derived from grass fed cows and is 100% vegetarian. Great! that being said, many of the negative aspects of purchasing non-organic products – contaminants such as pesticides, antibiotics, hormones etc may be irrelevant anyway as they would have been removed during processing. 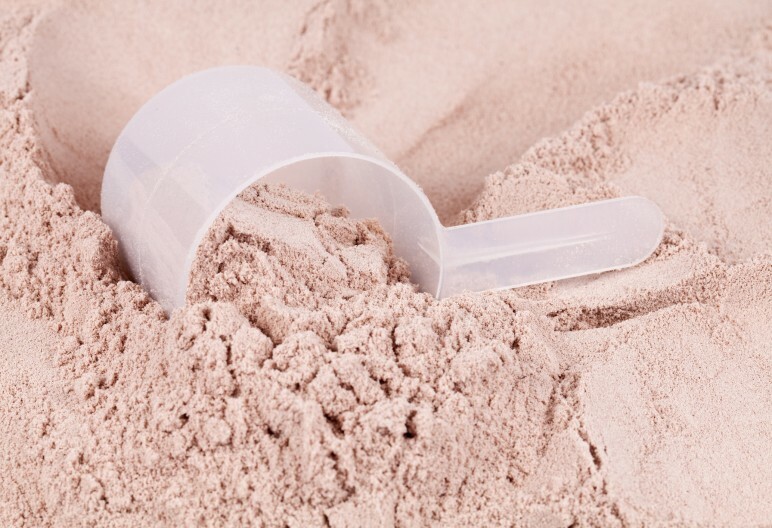 A high-quality whey protein should not contain any contaminants. Additionally, if we are purchasing organic because of the beneficial ingredients (found in larger quantities in grass fed cattle than their grain fed cousins), then they are present primarily in the milk fat which is also removed during the processing of isolates. Therefore whey doesn’t need to be organic (unless for ethical reasons), as it may not necessarily be superior. If you agree, or alternatively are on a budget, I recommend Impact whey isolate from My Protein which is an excellent protein isolate. It is also ranked No.1 for quality and value by LabDoor. I advise that you purchase the natural chocolate flavour with just lecithin and cocoa powder added. I also recommend Naked Diet Whey Isolate 97 from The Protein Works – It’s a whey protein isolate containing 97% pure protein and also includes natural flavours, colours and stevia as a sweetener. You should ideally be ingesting a whey shake after every intense weight training workout. This will ensure that you are supplying muscle tissue with the precise amino acid profile needed to accelerate the repair and rebuilding process. In conclusion, research has shown that whey is extremely beneficial for a multitude of reasons. It is not a magic potion however, so please do not believe it will add slabs of meat to your body in a short time, just because you’ve added it to your diet, because it wont, despite what some manafacturers would have you believe. I hope this article has also helped clarify some of the factors guiding your choice of the best whey protein powder to purchase.